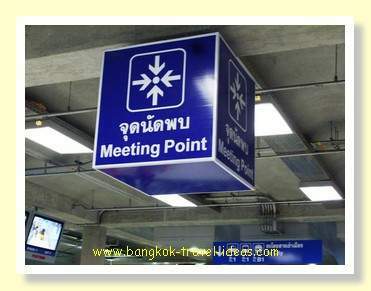 I had organised a car for a Bangkok Airport to Pattaya transfer and so walked over to the Meeting Point sign to wait for my lift. 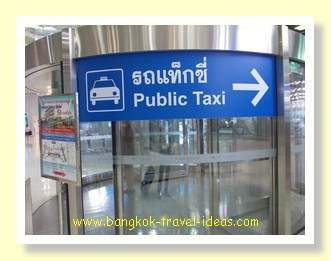 However if you arrive at Suvarnabhumi Airport and want to take a taxi to Pattaya instead, then you can go down to the taxi stand on the lower level. The taxi fare to Pattaya will be around 1200-1400 Baht. This should be inclusive of the tolls, which are around 100 Baht. Tip: Continue walking out of the international arrivals area and go over to the where the domestic passengers arrive, where you will be approached by taxi touts. Let them approach you and make an offer of a price. If you get an offer in the range 900-1000 Baht for the trip from Bangkok Airport to Pattaya then you should probably accept it, otherwise just keep walking. I have heard that it is possible to get the cost of a taxi from Bangkok Airport to Pattaya as low as 800 Baht, but with the recent increase in fuel prices it is probably not so likely now. But it is possible to get the taxi fare to Pattaya slightly cheaper than the first quote, if you have the time to bargain. My personal taxi from Bangkok Airport to Pattaya was a little delayed due to a make-up issue, so rather than just stand around and wait under the Suvarnabhumi Airport Meeting Point sign, I took the escalator down to the lower level of the Bangkok Airport building. 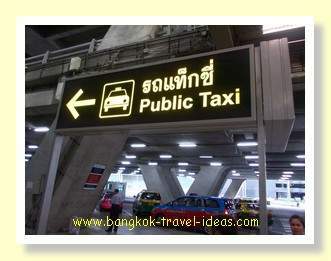 I wanted to take some photographs of the taxi stand and the line of Bangkok taxis to help other travellers that visit my website. Even at that early hour of the day it was quite warm and the humidity attacked me as I left the building pulling my suitcase behind me. At this time in the morning there were only a few passengers waiting to take a taxi from Bangkok Airport and it was quiet. Some of the people were also going from Bangkok Airport to Pattaya and some were going directly to Bangkok. This lower level is also the place to come if you are a cigarette smoker. If you want to smoke at Suvarnabhumi Airport after a long flight, then there are a couple of areas designated for smokers in this outside level on the ground floor once you have cleared immigration. After a long flight you may also be hungry and have some time to kill. If so, then down the end of this level is the Magic Food Point. This is the place where all the airport workers come to eat, so it is not expensive. You will see the place to stand to get a taxi and there is an assistant with good English at the front of each line, who can check your hotel address and tell the driver your destination. Today there were not many passengers, but at other times I have seen all the aisles and desks occupied and people queuing way back. 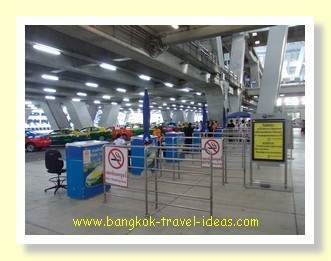 If you ever need to take the Bangkok Airport bus to Pattaya then just further along on this level at Gate No. 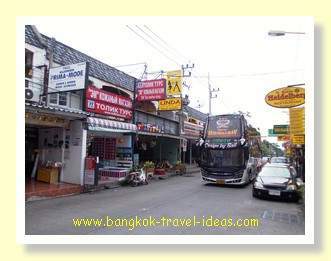 8 is where you buy the bus tickets for either the 389 Airport Bus to Pattaya or Bells Travel Service to Pattaya. After wandering around outside and taking a few photographs of the taxis and the taxi stands I went back into the building on up the escalators to the Meeting Point sign and waited for my car to take me from Bangkok Airport to Pattaya. Shortly afterwards, my welcoming party turned up and we took the escalator up to the car park, loaded my suitcase into the car and set off to go to the Centara Grand Mirage Beach Resort at Wong Amat Beach, Pattaya. The Suvarnabhumi Airport car park has a small parking fee. In this case it was only 20 Baht for the short time the car was parked and we had to pay at the boom gate on the way out. The short term car park is usually very full and most cars are double parked, but fortunately we had not been blocked in by another vehicle, so we were away in a flash. To go from Bangkok Airport to Pattaya you need to first to leave the Suvarnabhumi Airport complex and get on the Bangkok-Chonburi Motorway, and then follow the signs for Chonburi. Basically after that it is a straight road to Pattaya and you can complete the drive from Suvarnabhumi Airport to Pattaya in about 90 minutes. There are toll booths at various sections and from memory there were a total of three collection points as we headed towards Pattaya from Bangkok and it was about 30 Baht at each one. The weather was fine and dry, but slightly overcast and after driving towards Pattaya for about 45 minutes and after Chacheongsao we left the motorway and called into the Service Centre to fill up with fuel and to get some Thai food to eat. I hadn't eaten on the plane and was feeling hungry. There are plenty of Thai noodle shops and restaurants to choose from at this Service Centre and we entered one at random and ordered some Thai noodle soup. We sat quietly, ate our food and before long were back on our way to Pattaya. Tip: If you are going to Bang Saen beach then this is the place to stock up with beer and ice for the beach. Just go into the 7-11 and you will find that they have all you want. Bang Saen doesn't really have any shops near to the beach so if you don't stock up here then you will have to buy off the beach vendors and pay higher prices or you have to make a long trek to a store. Today was a Tuesday and it was still relatively early in the morning, but there were quite a lot of heavy vehicles on the way to Pattaya. I find that it is best to stay well clear of any heavy goods vehicles in Thailand as they can change lane unexpectedly. 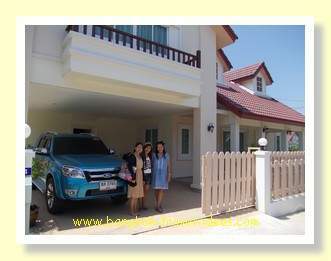 Another 45 minutes or so saw us approaching the town of Pattaya and as we were going to be too early to check-in at the Centara Grand Mirage Beach Resort we met up with friend on the road and then followed her car and went to visit her new house. We stayed there for a couple of hours, filling up on snacks and catching up on old times, before setting off back into Pattaya town. After only as short drive we approached the Dolphin roundabout at the entrance to Pattaya Beach road. The Dolphin roundabout was fairly busy and so we entered the roundabout quite stealthily and took a right turn to go along Naklua Road. We were on the lookout for Soi Naklua 18 (Wong Amat), which is the soi that the Centara Grand Mirage Beach Resort was located on and so drove quite slowly. The Thai street numbers are identified on blue poles at the entrance to each soi, they are not that easy to see, but about 500 metres along we saw what we wanted and took a left into the correct soi. Soi 18 was very narrow and there were some big coaches on it. We headed carefully down towards the Centara Grand Mirage Beach Resort and dropped the luggage at the reception area and then parked the car. The drive from Bangkok Airport to Pattaya is very straight forward and although we had a side trip to visit my friend it is an easy 1.75 hours on the motorway. Continue reading to find out about the Centara Grand Mirage Beach Hotel or my visit to Pattaya, Thailand in my Thailand Travel Diary, by following the random links below. If you miss any pages just return to the Travel Diary page. If you are heading to Pattaya then read a not so exciting look at Pattaya nightlife, through the eyes of my good self. Visit the Pattaya Floating Market on Sukhumvit Road just outside Pattaya and have a real Thai day out.